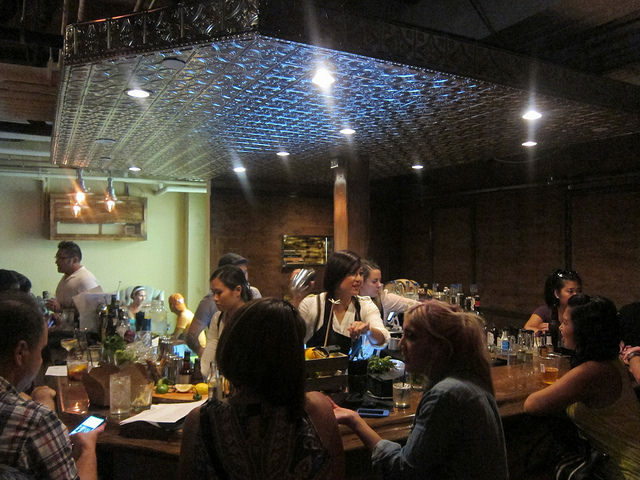 The Blind Rabbit in Anaheim is the latest speakeasy style bar to hit Orange County. Find it tucked behind a wall of Japanese beer kegs in the new Anaheim Packing House, part of the Packing District. Just look for Rolling Boil, the hot pot place and the kegs are to the left. But like any true speakeasy, you need a password which is available on their Instagram page. The password is randomly posted then deleted daily. On the evening I visited, the wait was 2 hours without a password so get that password. Once inside, you’ll find the large bar dominates the room. There are a few tables as well as a photo booth as well. A friend had his usual Negroni. This one was made with aged gin which was an interesting take on it. 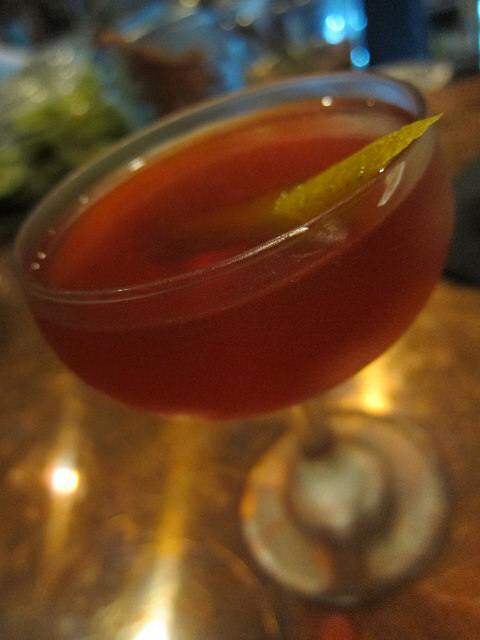 I generally find myself reaching for a London dry or a new world gin for Negronis. I’d like to see the aged gin in a white Negroni instead. 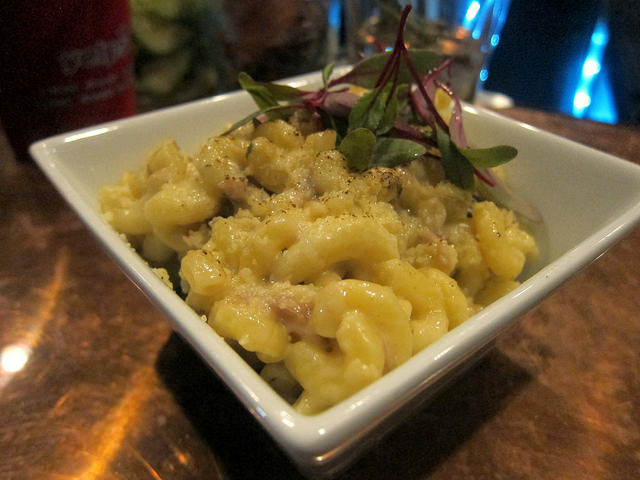 There is a short bar menu list which includes duck confit mac and cheese. If you didn’t get hot pot before hand, indulge in a bowl of creamy mac. The pork two ways sounded interesting with pork belly and pig ears with a black garlic emulsion, black Mission figs, chili and Thai basil. For my not-so-sweet-tooth, the Earl Grey panna cotta sounded interesting between the cinnamon toast crunch sorbet, blueberry ice, strawberry peals and viola petals. I could see all the floral notes working with the the spices. The Blind Rabbit had just opened so I’ll forgive them on this glass they served the Dark Holiday in. It looked like a short pour and would look better served in a smaller glass. Or just give me more to drink. I could see where this drink was going though. It could be considered tiki-ish (though any drink with rum tends to be lumped into that category). 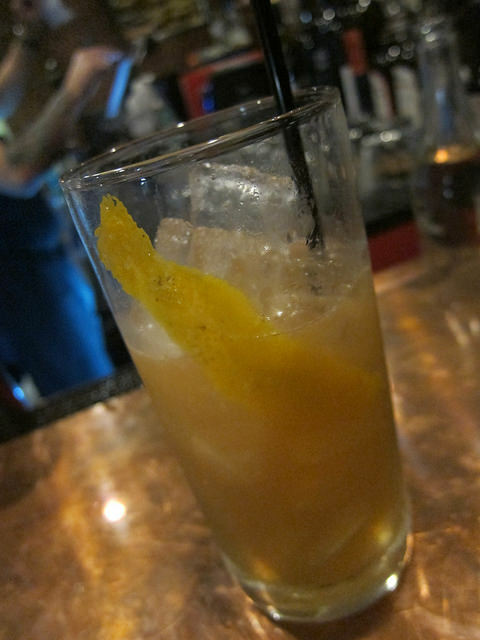 I also tried the Blind Rabbit Sour which was essentially a whiskey sour. Once I saw there was amaro in this, I asked for less sweetness. It came out still a bit too sweet for me. Someone suggested to me that Orange County has a lot of catching up to do in terms of palate. Perhaps some might thing this drink would get more people to drink whiskey but I’d pick a different starter whiskey cocktail for them. 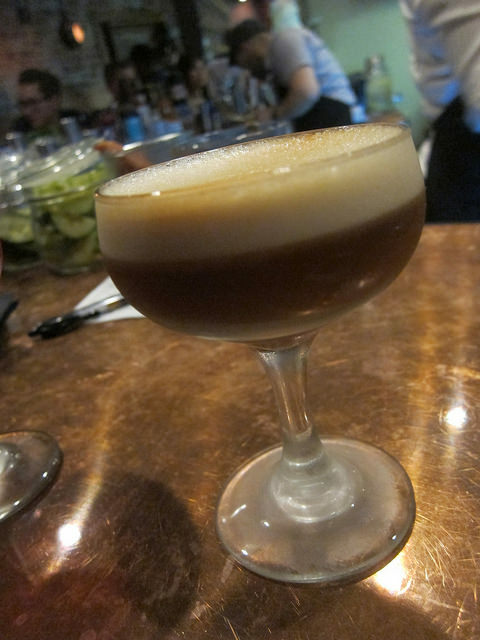 There are some who think raw egg white in drinks is kooky so there’s that challenge there. Actually, if they knew cow’s foot jelly (gelatin) was originally used in drinks to give that silky texture, they would definitely opt for egg white! Overall I think it’s excellent there are a few choices for libations at the Packing house. If you want beer (and waffles), go to Iron Press. If you want something to go with your food from the many vendors, try Hammer Workshop & Bar. 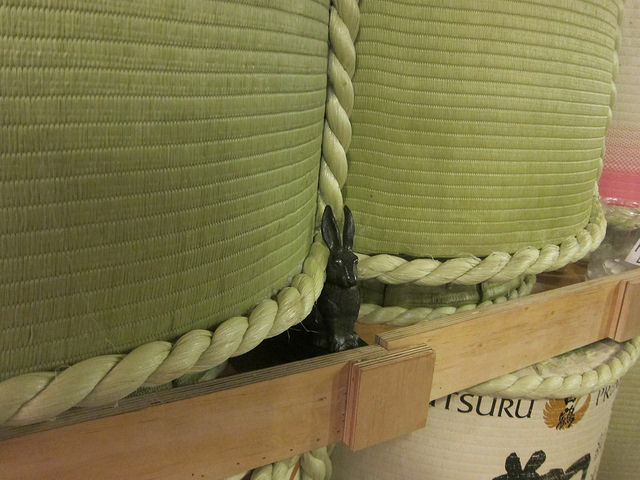 But if you want to take friends to a secret bar, check out The Blind Rabbit.